When trying to identify the composition of a solution, one experiment scientists can perform is titration. At its basic level, titration means slowly dripping a known solution into a second solution until an expected reaction takes place. Depending on the sample the scientist is investigating and his lab's supplies, he can choose from four main types of titration. During titration experiments, a scientist will have a reagent--a solution with a known chemical make up and concentration--and a sample. The scientist may have a general idea of what the sample is, but needs to know the concentration of a chemical in the sample. For example, when a scientist wants to find out how much of a certain pollutant is in drinking water. In a basic titration experiment, the reagent is added to the sample until a specific reaction occurs. This reaction could be a color change, a pH change or the precipitation of a chemical in the sample--precipitation is when a reaction occurs and causes a solid to form within a liquid. The amount of reagent used to cause the reaction, tells the scientist the concentration of the sought-after chemical in the sample. To determine the content of a specific acid such as hydrochloric acid or a base, such as sodium hydroxide, in a liquid, chemists opt for acid-base titration. When analyzing a solution for acid, the process is called acidimetry; when analyzing for a base it is called alkalimetry. In this type of titration a reagent is added until the sample solution reaches a specified pH level. This type of titration relies on a pH meter or a dye to track the change in pH. Like litmus paper, the dye will change to a certain color once the correct pH has been reached. Also known a redox titration, this form of titration relies on a gain or loss of electrons within a sample to find out what is in the sample. Redox titration can be used to study contamination in drinking water or the concentration of metals within a solution. 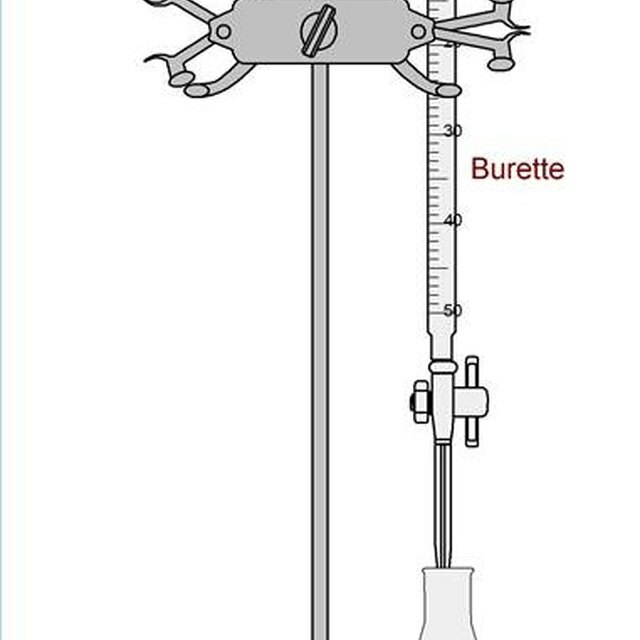 This type of titration has many names depending on the substance used to cause the observable change during titration. For example, in permanganate titrations, potassium permanganate -- a form of salt -- causes a reaction that can show how much hydrogen peroxide is in a sample. In precipitation titration, a reagent is added to a sample until a reaction occurs that causes a solid to precipitate from -- or "fall out" -- of the sample. 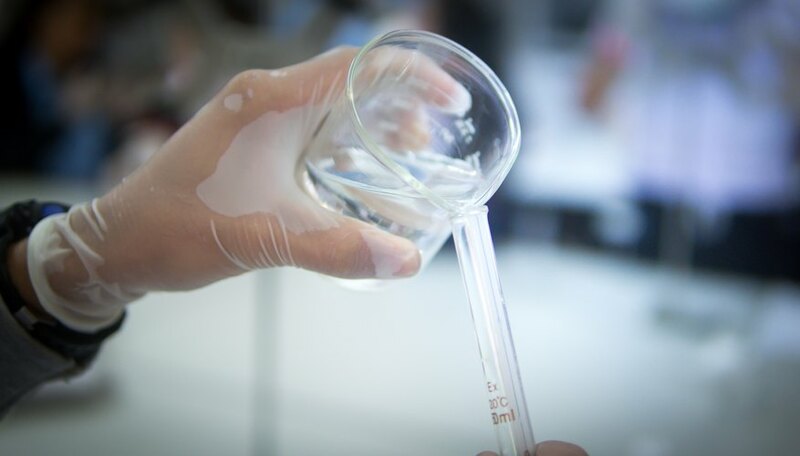 Precipitation titration can determine the amount of salts in a solution, how much chloride is in drinking water and the amount of specific metals within a sample. This is a another form of titration that can have different names depending on the reagent being used. For example, argentometric titrations use silver nitrate -- silver's Latin name is "argentum." When the silver nitrate is added to a sample that contains sodium chloride, a reaction occurs causing white solids of silver chloride to precipitate from the solution. This type of titration is similar to precipitation titration in that a solid precipitates out of the sample when a reagent is added. The difference is that in complexometric titration, the solid is formed more quickly and more completely than in precipitation titration, which reduces errors in measurement. Ethylenediaminetetraacetic acid, an acidic powder better known as EDTA, is commonly used in this type of titration because it readily bonds with metals. This type of titration can be used to measure the ingredients within soaps and detergents. Painter, Tammie. "Types of Titration." Sciencing, https://sciencing.com/types-titration-14630.html. 30 April 2018.